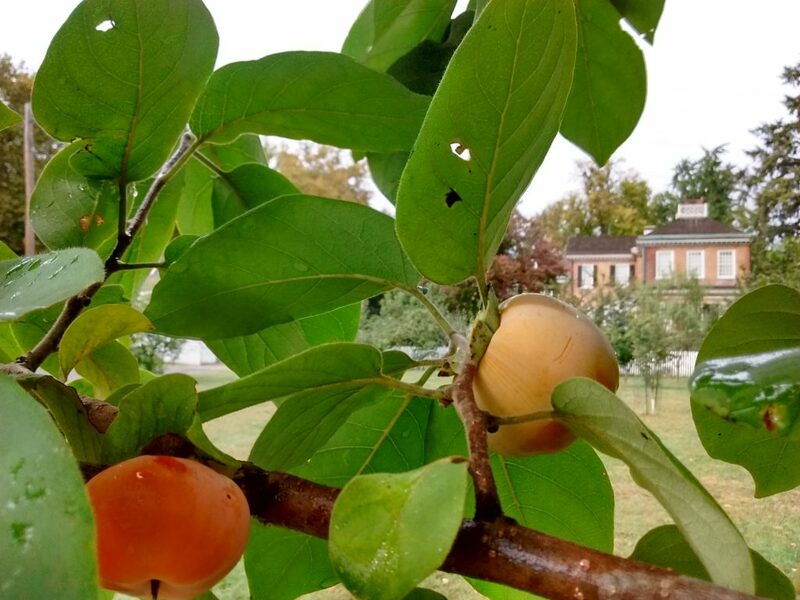 Asian persimmons ripening at Bartram’s Garden in West Philadelphia. Non-astringent varieties can be harvested while still firm. Asian Persimmon (Diospyros kaki) is native to China, where it has been cultivated for centuries. Korea and Japan have also been centers of its cultivation, and it was introduced to California in the mid 1800’s. Asian Persimmons usually grow between 13-20 ft tall and wide and are self-fertile. At our community orchards, POP usually favors planting non-astringent cultivars such as ‘Fuyu’ and ‘Jiro’. The native American Persimmon (Diospyros virginiana) is a much larger tree, growing 30-50 ft tall, but with smaller fruit. It is also more cold hardy. 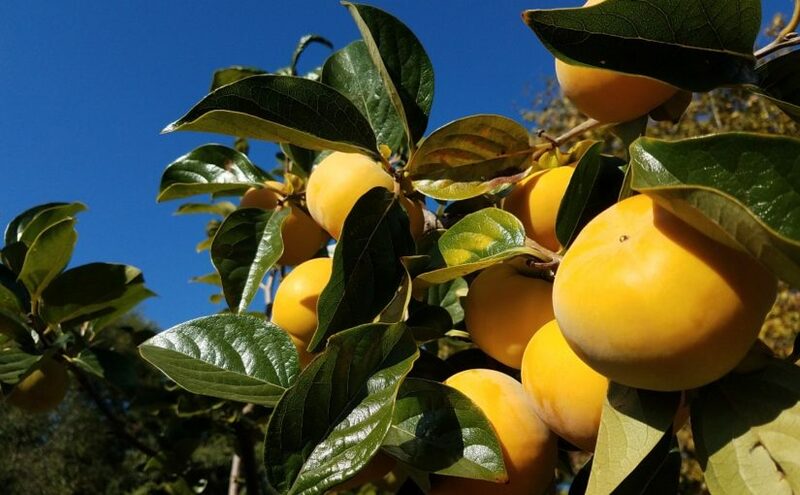 Except for a few self-fertile varieties, American Persimmons require a separate male and female tree for pollination (only female trees bear fruit). 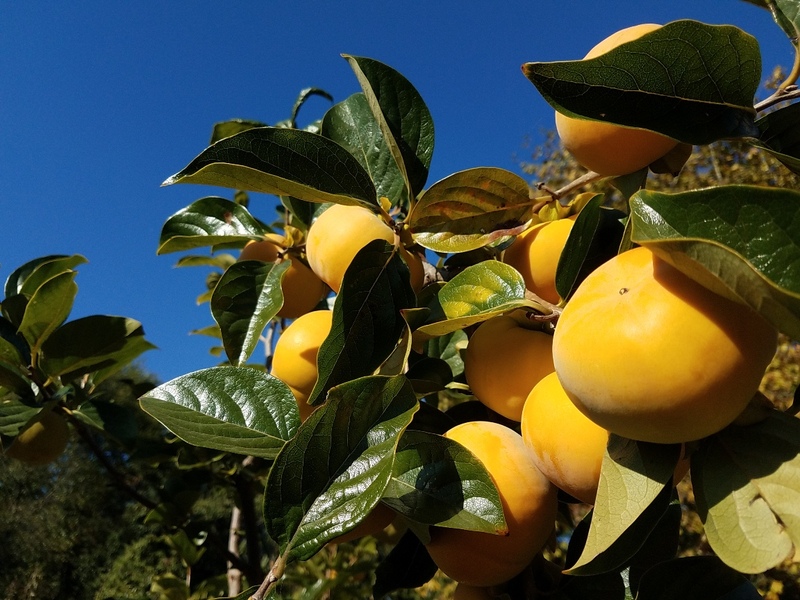 Due to limitations of space required, POP generally only plants native persimmons in larger park settings and favors self-fertile cultivars like ‘Meader’ and ‘Early Golden’. There are also a few hybrid Asian/American persimmons varieties, including ‘Nikita’s Gift’. Persimmons belong to the Ebenaceae botanical family, valued for its wood and fruits. Persimmons are usually propagated by grafting scionwood or buds to selected rootstock; seed stratification is also possible. Pollinators of this tree include wild bees, bumblebees, and honeybees. Persimmons have proved one of the easiest fruits to grow in Philadelphia, with consistent harvests and few pest and disease challenges. Persimmons are easy to grow with few ongoing care requirements. Asian Persimmons grow in hardiness zones 7-10 and do best in areas that have moderate winters and relatively mild summers. American Persimmons are hardier, adaptable to zones 5-9. WINTER/SPRING: Late-winter pruning is helpful for shape and rejuvenation, with modified central leader being the most common form. In the spring, non-blooming persimmons may require an application of bonemeal to boost phosphorous. SUMMER: Water young trees thoroughly once a week during their first year. Persimmons have few pest or disease problems in our region, thus requiring little other attention. FALL: Persimmons are one of the latest ripening fruits in our orchard spaces. Harvest and process the fruit from October to December depending on the variety. Harvest non-astringent Asian varieties when they are hard, but fully colored (ranging from light yellow-orange to dark orange-red). American and astringent Asian varieties should not be harvested until soft, as fruit picked too early will cause your mouth to feel dry and pucker from the astringency! Sweetness is often improved after the first frost. 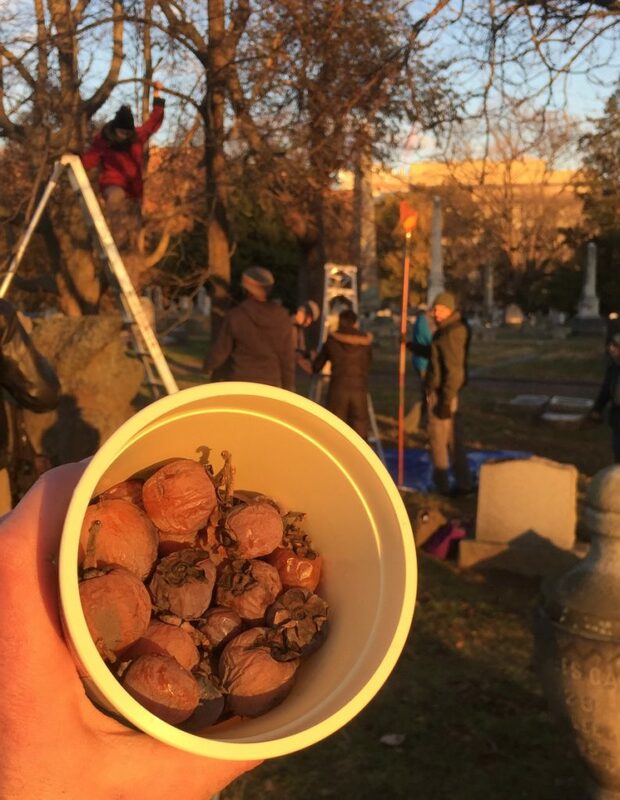 Volunteers harvesting American persimmons at The Woodlands in West Philadelphia. Most effective technique was to shake branches and capture fruit on a tarp below. Before consuming persimmons, please read POP’s edible plant disclaimer below. Persimmon fruit is a very good source of dietary fiber with 100 g containing about 9.5% of recommended daily intake of soluble and insoluble fiber. Fresh and dried Persimmon fruit also contain healthy amounts of minerals like potassium, manganese (15% of DRI), copper (12% of DRI), and phosphorus. It is moderately high in calories (provides 70 calories/100 g) but very low in fats. Persimmons can be eaten fresh, dried, and cooked. Dried persimmon fruits are popular in Japan and often used in cookies, cakes, muffins, puddings, salads and as a topping in breakfast cereal. The Philadelphia Orchard Project stresses that you should not consume parts of any wild edible plants, herbs, weeds, trees,​ or bushes until you have verified with your health professional that they are safe for you. As with any new foods that you wish to try, it is best to introduce them slowly into your diet in small amounts. disease, illness, or injury, or before attempting any traditional or folk remedies. Keep all plants away from children. As with any natural product, they can be toxic if misused. To the best of our knowledge,​ the information contained herein is accurate and we have endeavored to provide sources for any borrowed​ material. Any testimonials on this web site are based on individual results and do not constitute a warranty of safety or guarantee that you will achieve the same results. Neither the Philadelphia Orchard Project nor its employees, volunteers, or website contributors may be held liable or responsible for any allergy, illness,​ or injurious effect that any person or animal may suffer as a result of reliance on the information contained on this website nor as a result of the ingestion or use of any of the plants mentioned ​herein. 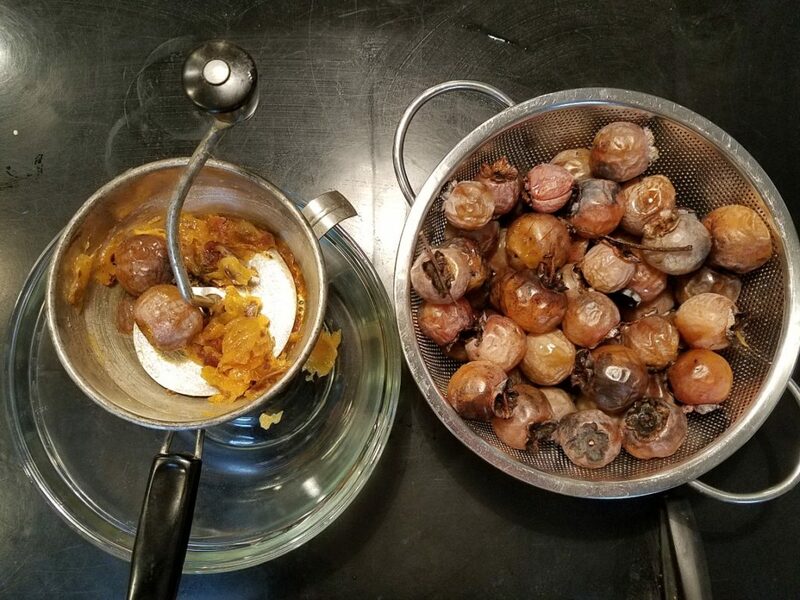 A food mill or strainer can be used to separate persimmon pulp from seeds and skin for use in baked goods, fruit leather, etc. 1. Preheat oven to 325 degrees F (165 degrees C). Oil a 9×4 inch pan. 2. In a small bowl, combine flour, cinnamon, salt, nuts, and raisins. 3. In a large bowl, blend eggs, sugar, and oil. Mix baking soda into pulp, and add to bowl. Fold in flour mixture. 4. Pour batter into prepared pan. 5. Bake for 75 minutes, or until tester inserted in the center comes out clean. This POP Blog was written by 2018 Repair the World Fellow Megan Brookens with assistance from Executive Director Phil Forsyth and Admin Assistant Natalie Agoos.